The theme for our April story slam was GOING THE DISTANCE. We heard stories of great physical distances traveled, geographic distances that felt hopelessly far, and two pregnancy and delivery stories. Ty Lohr won with his story about the first road trip he and his friend took as adults. Ty is pictured here with this month's host, Meagan Given. 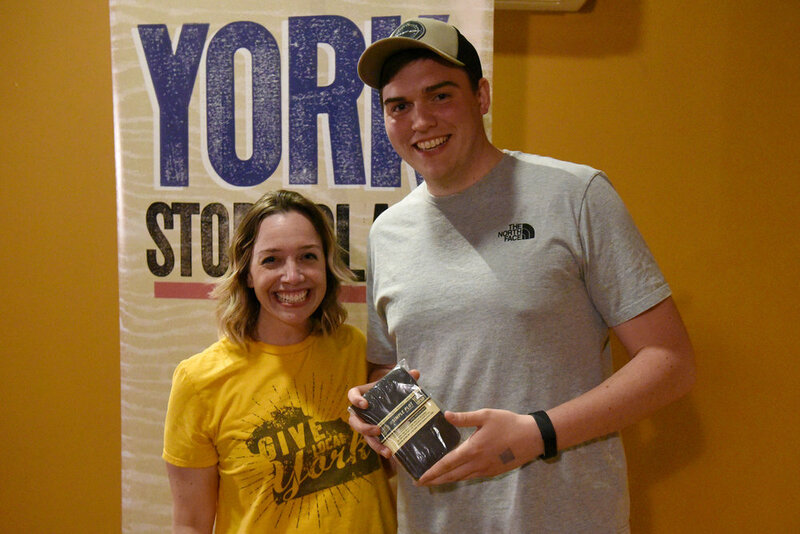 Ty won an exclusive York Story Slam journal from our friends at Story Supply Co. and earned a spot in our Grand Slam in November. Tickets for our May story slam are on sale now. The theme is LOST AND FOUND. Our first four events in 2019 have sold out in advance, so we recommend getting your tickets now!